Carli Lloyd earned her eighth international hat trick on Sunday night as the USA cemented their place atop the group at the CONCACAF Women's Championship. 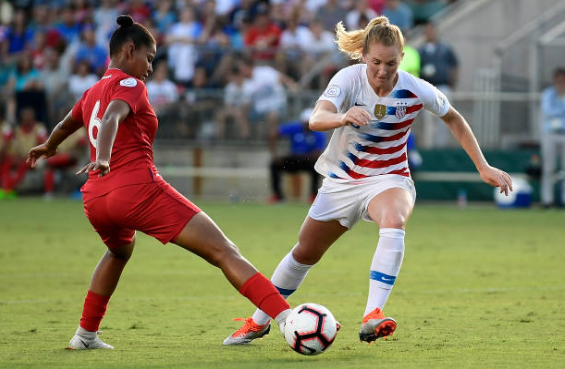 The United States Women's National Team is all but assured to make it to the semifinals of the CONCACAF Women's Championship after a 5-0 victory over Panama in their second match. The United States was able to build on their 6-0 win over Mexico from the first match and just has Trinidad and Tobago remaining in group play. The first goal of the match came in the fifth minute when Samantha Mewis earned a foul just outside the penalty area. She took the free kick, but it was blocked just over the goal by Panama goalkeeper Yenith Bailey. The ensuing corner was taken by Christen Press and this time Mewis was able to redirect the ball down and into the right-side netting of the goal. 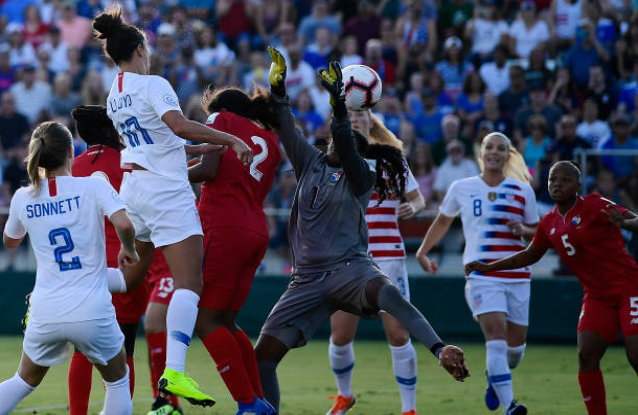 The 1-0 scoreline was nearly extended in the 13th minute when Carli Lloyd headed the ball right at the goalkeeper and then hit the post with her rebound shot. Lloyd wouldn't miss the next opportunity. In the 23rd minute, a Casey Short corner kick found its way across the box. Lloyd headed the ball right at the keeper again, but this time she wasn't able to stop the ball from finding the back of the net. It took just six more minutes for Lloyd to extend the scoreline to 3-0. She collected the ball at the top of the six-yard box, stared down the goalkeeper, and placed it perfectly into the right side of the goal to complete the brace. In the 32nd minute, it was time for Press to get a goal of her own. The ball found her at midfield, she outran the Panamanian defense, left the goalie on the ground in the box, and then sent a shot into the top netting. The first half would end with that 4-0 scoreline. The second half started quickly for the United States. Mallory Pugh earned a free kick from just outside the box. Substitute Rose Lavelle stood over the ball, curled it into the box, and found the head of Lloyd. The striker headed the ball down and past the goalkeeper to complete her hat trick. There was a nearly a sixth USA scored in the 54th minute off the head of Press, but it was disallowed due to an offsides call. Two minutes later, in the 56th minute, a shot from Lavelle just missed the far post. The sixth goal appeared to come in the 73rd minute when Pugh was able to put the ball between two defenders while the goalkeeper was down injured. The goal was called back without an announcement, though. The game would end at 5-0. The USA now has six points and leads the group. They will face off against Trinidad and Tobago on Wednesday evening. A win or draw would ensure a first-place finish in Group A. Panama and Mexico will face off to determine who gets the second semifinal spot in the group. Panama currently sits in second place, so Mexico needs a win to advance.